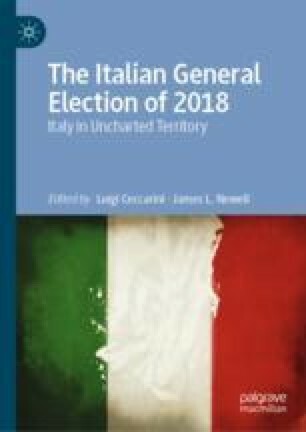 This chapter investigates communication in the traditional media and politicians’ strategies in the months preceding the first Italian election held under a new electoral law which makes it extremely difficult for any single political entity to win an outright majority. The chapter presents empirical data on the volume and tone of the coverage devoted by TV news broadcasts and newspapers to the central actors and topics of the campaign, and it reconstructs the leaders’ communication styles in the traditional and social media. The chapter reveals that the journalistic narratives, which mainly focused on post-election agreements, contrasted with the campaigning strategies of the most successful leaders. In fact, while Salvini and Di Maio managed to mobilise a variegated majority of voters by responding to their common demand for change, journalists failed to detect the existence of significant elements of commonality among Italian public opinion.